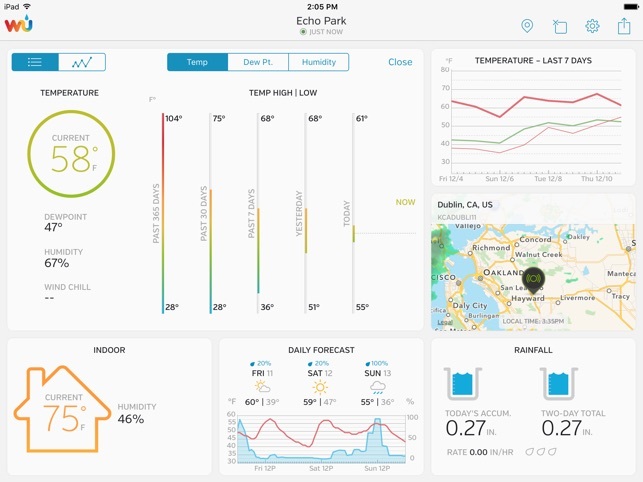 We've taken weather data to the next level with WunderStation for iPad and iPad Pro. 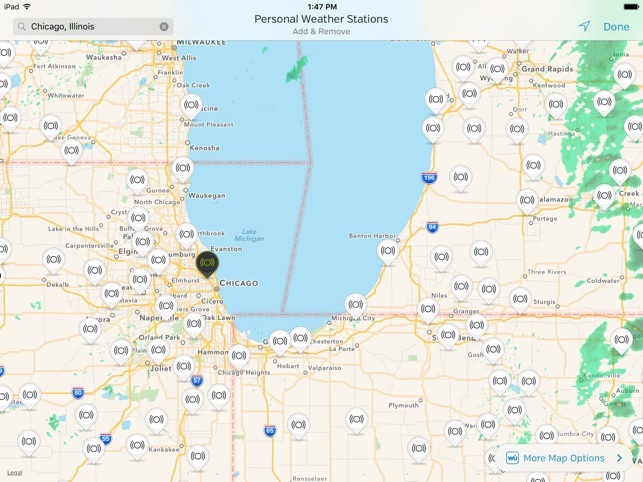 WunderStation brings you rapid-fire current conditions, forecasts, and historical weather data from any weather station in Weather Underground's network of over 180K+ personal weather stations. 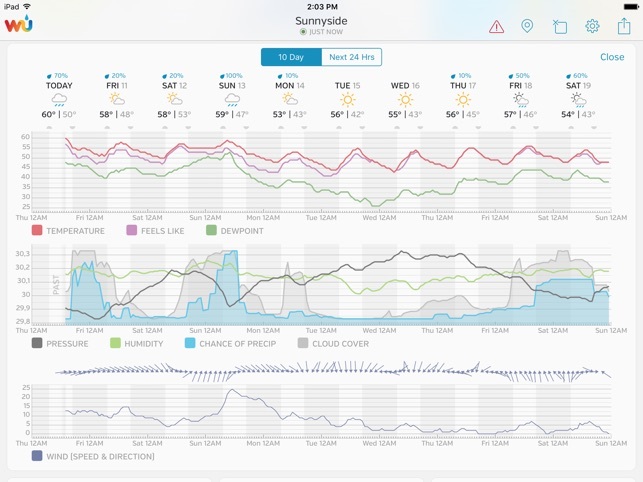 View, analyze, share and compare data from local personal weather stations with elegant, customizable graphs, infographics, animated wind direction, rainfall totals, and more! 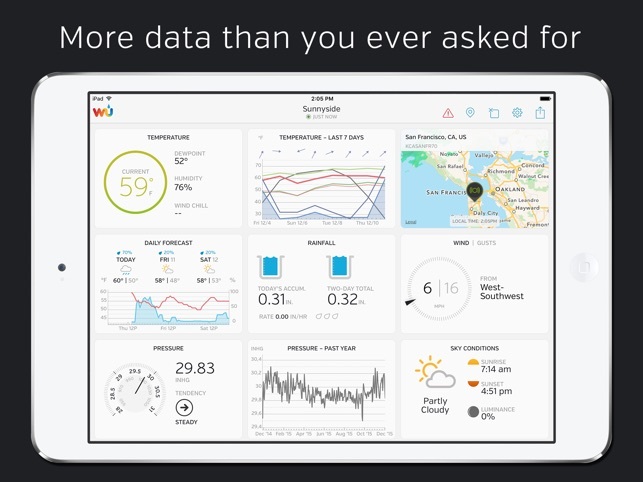 Whether you own a personal weather station or you just like to dive into the data, WunderStation is the app for you! 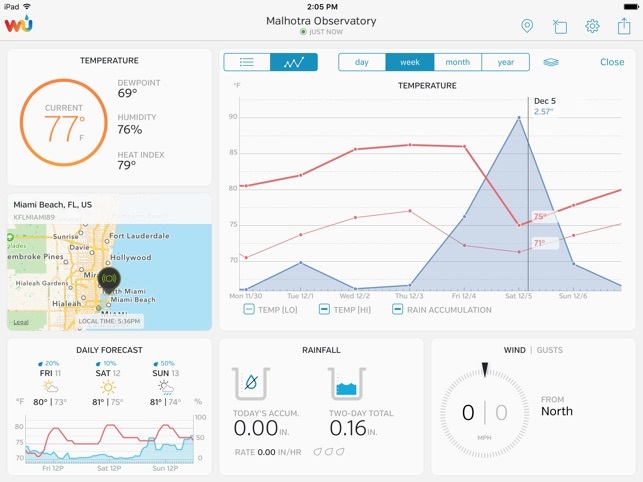 WunderStation allows you to customize how you view and analyze weather data. Add any station from our network to your list of stations to compare current and historical conditions. Drag, drop, add or delete content widgets from the dashboard to view the data that's most important to you. Expand individual widgets and toggle between an animated infographic view or a graph view, and add layers for additional measurements to compare trends over time. In addition to the standard weather measurements, WunderStation can also chart additional sensors (indoor temperature and humidity, UV index, and solar radiation). Our PWS network is comprised of over 140,000 individually-owned weather stations across the globe that send live weather conditions to us as often as every 2.5 seconds. Started in 2001, the Weather Underground PWS network was developed to address the growing need for our meteorologists to gain access to more granular data. The network allows us to access weather data from actual neighborhoods, not just from the closest airport. Our meteorologists spent over five years developing and testing this revolutionary forecasting system, which leverages the constant stream of neighborhood weather data that we receive from our community of dedicated personal weather station owners around the globe. • Performance enhancements and bug fixes. As always, we appreciate your feedback. Please email us at feedback@wunderground.com with any suggestions or questions. If you like these changes, please let us know by rating and reviewing us in the App Store! This app is near perfect. It is intuitive, packed with useable information, very customizable, and very nice to look at - with a clean, almost minimal, style. It appears to give very accurate information, as borne out by other, more technically-minded reviewers. I have set it up with the three weather stations closest to my address, and they all agree within expected margins. I have only two suggestion for improvement, both of them aesthetic. The first would be the addition of a darker theme, as the predominantly-white display can be a little wearing on the eyes. Second, I wish the meter and text in the wind/gusts widget were placed a little farther over to the right. The meter looks crowded against the left side of the widget, and could be moved across without compromising the space needed for the longest word of text ('southwest'). Other than these small gripes, this is an excellent app. It remains to be seen if Weather Underground will cripple it with advertising in the future: if they do so it would be regrettable, but I would most likely pay for an ad-free version anyway. You definitely should download it and see if it meets your needs. WunderStation is one of those apps that you'd think would be appealing to a certain audience—in this case, those of us who run sensor arrays and gather meteorological data. It is billed as a portable dashboard for your station. The tile-based modular interface allows a great degree of customization, and includes data that is sent to Weather Underground but not displayed anywhere on their site, such as the stream from an indoor temperature sensor. It allows some spot analysis, and is especially helpful if one is traveling and wants to check "in depth" on the health of a weather station. All of this being true, it is also completely possible to use and enjoy this without running your own station. WunderStation includes a map-based selection tool to discover and favorite any station in the Wunderground network. Choose as many as you'd like, and take a peek into their data. The app makes this very easy, while preserving privacy for the local station owner. This app has improved and stabilized tremendously over the 11 months I have used it. Highly recommended. A great weather App if you have a weather station or not! 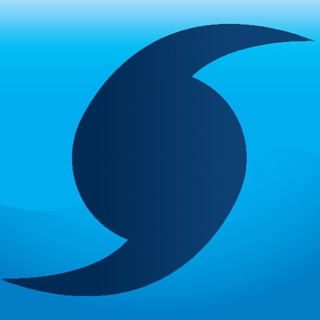 If you have a personal weather station, this app is a must. Easy to upload your data to Weather Underground and see it all here, organized and customizable. Wether you have a pws or not, you get the usual access to radar, 10 day, daily and hourly forecasts, etc. plus info and data that you don't get on another weather app. My favorite is getting a forecast for how much rain is expected, along with the usual percent chance of getting rain. You also have access to data from personal weather stations everywhere. This is real-time data like how much rain has fallen, wind, humidity, etc. May of the stations also have a web cam so that you can see the current conditions for yourself. The only negative is that is can be slow to load at times. Nevertheless I highly recommend this app. Try it! Requires iOS 10.3 or later. Compatible with iPad. Copyright © 2011-2018 Weather Underground LLC. All Rights Reserved.